The world of Cafes Novell is all about seducing people’s senses through the perfect cup of coffee in a restaurant, in a coffee shop, at work or at home. Since 1958, Cafes Novell selects the best coffee beans from the best coffee growing regions in the world to roast them at the optimal level and obtain the perfect espresso. 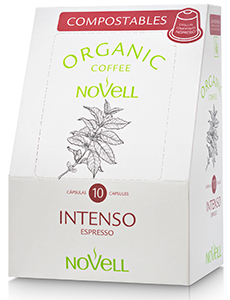 Nespresso Compatible Compostable Capsules "Intenso"
100% Organic Arabica . Fine and balanced, with a tendency towards acidity. You will find hints of caramel, bitter chocolate and roasted nuts, with a fresh and and floral aroma with a touch of vanilla.